The folding shovel is compact and durable for your next task. Whether you're working at home or on the go, this fold-up shovel provides reliable durability and practicality due to its multifunction. It uses a tempered steel blade with teeth in one side for cutting and slashing. The blade can be rotated 90°to pick or to be used as a hoe. You can use the pointed end of the pink directly by rotating the blade a full 180°. When folded, it takes up about the same space as a stack of paper plates.A locking collar keeps your shovel folded when it's not in use. 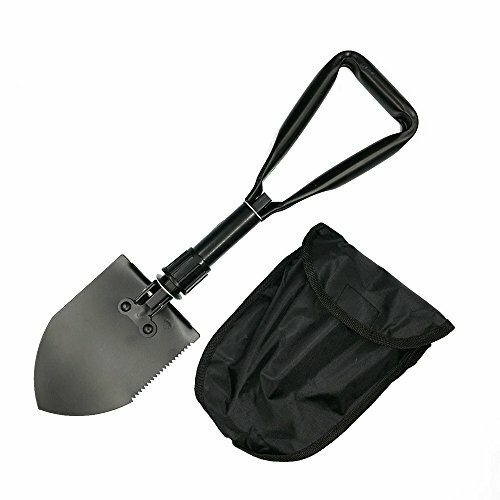 You'll love this shovel in one lightweight and compact package. LIGHTWEIGH AND FOLDABLE: The tri-fold shovel weighs only 1.33 pound which is ultralight for you to carry. MULTIFUNCTIONAL TOOL: It can works as shovel, pickaxe, saw, hoe, etc.Our folding shovel is a helper for your car,garden and outdoor activities. HIGH QUALITY AND COMFORTABLE: The camping shavel is stury and labor-saving with triangle handle,high strength carbon steel sharp blade and non-slip grip. The triangular handle is strong and fits comfortably in either hand. EASY TO STORAGE: It comes with a nylon carrying case with gear loops which can put or hang it in the corner. WIDELY USE: Design for exploring, camping, traveling, hiking, garden,driving emergent tools.It is also great for keeping in your vehicle in case of getting stuck in snow/mud. If you have any questions about this product by NACATIN, contact us by completing and submitting the form below. If you are looking for a specif part number, please include it with your message.